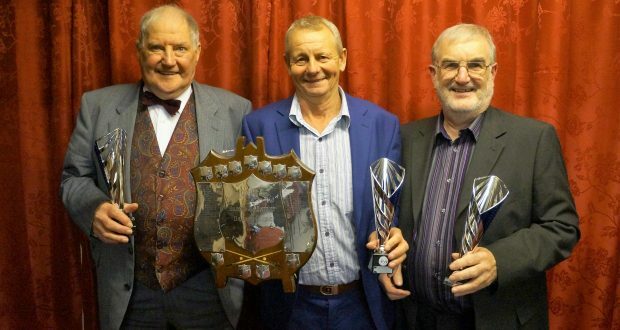 MATCH WINNER: John Twell (left) made a 36 break for Pyramid A against Services E.
It was a good week for Holbeach A in the Spalding and District Snooker League as the exciting Division One title race took another twist. With the top two beaten, third-placed Holbeach picked up a 4-2 success at Boundary B to go top and give themselves some serious momentum in the hunt for the top tier title. Wins from Mick Pearl (O14), Mick Ayres Jnr (R14) and Neal Jackson (O14) sealed the victory against the Deepings side, who did have a 21 break in a frame win from Dan Smith (O7) as some form of consolation. Past leaders Services E suffered a 4-2 home reverse against Pyramid A in a fixture that went the distance. John Twell (O7) was the match-winner for the Bourne side, making a 36 break en-route to victory in the fifth and final frame. 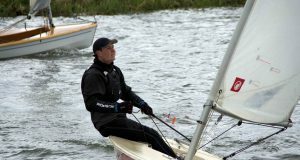 A 22 clearance in the opener from Vince Fitter (O28) was the highlight for Services, who are now second in the standings. A point behind them remain Pyramid B, who also suffered a 4-2 home loss. Services C were their conquerers, with Kevin Fitter (O21) securing the victory at the death. Elsewhere in the top flight, Tulips A continued their upturn in form with a 4-2 triumph at Holbeach C.
Black-ball victories from Mike Sampson (O7) and Bren Bowman (O56) proved key for the Spalding side, while Mark Gregory (O21) starred with a 25 clearance for the beaten hosts. Also on-song were rock-bottom Consti F, who dispatched hosts Services F 5-1 to keep themselves in touch with the sides above. 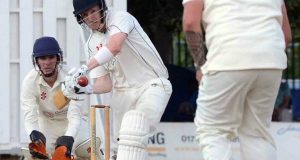 In Division Two, Consti G lost ground in the title race after going down 5-1 at Pyramid D. Both Marcus Hamilton (O28) and Lee Davies (O21) made breaks of 22 as the Bourne side ran out big winners. Holbeach B missed the chance to close in on them after they were upset 4-2 at Services B.
Tim Nash’s (O28) 25 clearance was the highlight for Services, while Bob Riches (scr) pocketed a 20 break as he won frame three for Holbeach. At the other end, rock-bottom Boundary C enjoyed a 4-2 victory over Crowland A thanks to frame successes from Mick Walker (O28), Shaun Ketteringham (O14) and Daz King (O14). Meanwhile, a 22 break and clearance from Jamie Mumby (scr) helped steer Gosberton A to a battling 4-2 win over Services A. Down in Division Three, a 36 break from Lee Pickett (O14) was the highlight as Holbeach E defeated Gosberton C 4-2. Geoff Ellingworth (R14) also impressed with a 21 break for Consti D.
His efforts helped fire his side to an impressive 5-1 triumph at Whittlesey B. Also picking up a five-point haul were Consti E, who had too much for opponents Donington D.
It was tighter between Pyramid E and Consti J, with the latter shading it 4-2 thanks to Trev Braybrook’s (scr) fourth-frame victory.